Dr. Kingsley Moghalu, former deputy governor of the Central Bank of Nigeria. Washington, DC — Kingsley Chiedu Moghalu, a former deputy governor of Nigeria's central bank, has urged the International Monetary Fund to assist the political leaders of natural resource-dependent African countries create risk management devices such as "hedging" contracts that would counter the negative macroeconomic effects of commodity price fluctuations by locking in oil price sales at specific prices. Moghalu made the recommendation at a conference that reviewed the latest IMF Africa Regional Economic Outlook report, released in October 2016. The Institute for International Economic Policy at George Washington University's Elliot School of International Affairs hosted the conference on January 24. 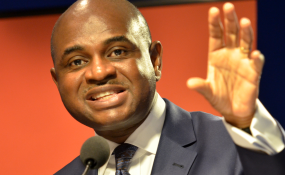 Moghalu served as deputy governor of the Central Bank of Nigeria from 2009 to 2014 and is currently a professor of international business and public policy at The Fletcher School of Law and Diplomacy at Tufts University in Boston,. Dr. Moghalu, who spoke on "Exchange Rate Regimes in Sub-Saharan Africa: Experiences and Lessons" drew a number of conclusions as lessons from plummeting commodity prices for resource-intensive African countries. He said these lessons included "the importance of the right kind of economic diversification which must be based on competitive advantage rather than comparative advantage, and having the right policy responses while addressing the countervailing political considerations that often prevent appropriate policy responses". The former central banker said other lessons from the ongoing macroeconomic crisis in commodity-dependent African countries include the need to build deeper economic policymaking competence, reinvigorate the independence of key economic institutions such as central banks to prevent politically motivated but erroneous policy choices, and technical support for risk management devices such as hedging, and savings funds. "The truth is that the fundamental problems of macroeconomic management in Africa often come from political economy factors", Moghalu told the conference. "The IMF needs to focus on this challenge and find a way to engage directly with heads of government with advice on the real macroeconomic consequences of certain political decisions". The IMF Regional Economic Outlook report assessed that Africa is experiencing "multi-speed growth", with "a tale of two Africas" in which non-resource-intensive countries – about half of the countries of the continent -- including Cote d'Ivoire, Ethiopia, Kenya and Senegal are likely to continue achieving high rates of Gross Domestic Product growth. "In contrast", the IMF report noted, "commodity exporters are under severe economic strains, including the region's three largest countries, Angola, Nigeria and South Africa. The near-term prospects of oil exporters in particular have worsened, notwithstanding the modest uptick in oil prices, as the slowdown is becoming entrenched". The Bretton Woods institution's report worried that "in the face of strong financial and economic pressures, the policy response in many of the hardest hit countries has been slow and piecemeal, often accompanied by stopgap measures such as central bank financing and accumulation of arrears, and leading to rapidly rising public debt. In oil-exporting countries with flexible regimes, exchange rates have been allowed to adjust only with reluctance, resulting in strong pressures on deposits and foreign exchange reserves. As a result, the delayed adjustment and ensuing policy uncertainty have been deterring investment and stifling new sources of growth – making a return to stronger growth rates more difficult", the IMF observed. The Fund recommended the need for a sustained adjustment effort that is based on "a comprehensive and internally consistent set of policies". Other speakers at the George Washington University event included senior IMF economists Celine Allard and Jesus Gonzales-Garcia, Stephen Smith, professor of economics and international affairs and director of the Institute for International Economic Policy, Ajay Chhibber, visiting scholar at the Elliot School of International Affairs and former United Nations Assistant Secretary-General and head of the Asia-Pacific Bureau in the UN Development Program, and Richard Grinker, professor of anthropology, international affairs and human sciences and director of the Institute for African Studies at George Washington University.